For the past week, my wife and I have been vacationing in southern California. We decided to spend our last full day of vacation birding in the San Jacinto Mountains near Idyllwild. We got up really early to start our hour drive from Palm Desert up the mountain. Since we left early, we got to view an amazing sunrise at a little pull off on our way up! Sunrise on the drive up the mountain. You can see the Salton Sea on the far right side of the photo. Our aim for the day was to bird at a couple of parks around Idyllwild. Idyllwild is a small town of about 3,000 people located up over 5,000 feet in the San Jacinto Mountains. Not only was this going to give us a chance to bird, it was also going to cool us off significantly. In Palm Desert, the highs had been around 107° all week and the high was only going to be 78° in the mountains! I had heard that the birding at Idyllwild Park was very good but I admittedly had not done my research and did not know where to go and did not realize that there were actually two sections of the park. We ended up starting out birding in the campground because that is where my gps took us. As we walked along the trails, we were greeted by tons of Acorn Woodpeckers and Mountain Chickadees! One of the many Acorn Woodpeckers in the mountains. We definitely enjoyed our hike but I was beginning to feel like we were missing something. Luckily, we ran into a local who told us all about the area. While she was not a birder, she did enjoy hiking and had some bird feeders up at home. She told us about the other entrance to the park where the nature center was located and then happened to mention that she had been seeing some quail in a nearby neighborhood and gave me directions on how to get there! We immediately headed for the other side of the park and we were not disappointed! After taking a look through their very cool nature center and picking up a copy of the Pines to Palms Birding and Nature Trail Map, we headed out on one of the trails. We hadn't even been hiking for five minutes when two woodpeckers landed on a tree just out of sight. 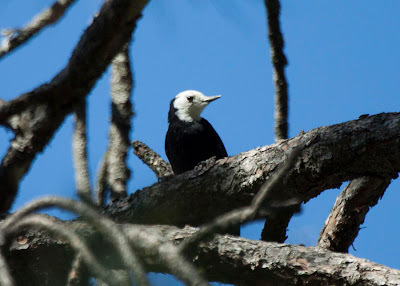 When I finally got into a better position, it was obvious that I had found my lifer White-headed Woodpeckers! I have wanted to see this species for a very long time and was extremely excited to get it on this trip. I had heard that it was difficult ot find this far south and had kinda given up on seeing it. We birded for a little long in the park and then decided to head on to some other areas. After a very scenic driving tour of a couple other parks, we checked the location we had been given for quail. We found the area easily but could not find any quail. As a consolation there were a ton of Western Bluebirds and my only Spotted Towhee of the day. Cafe Aroma, a great place for lunch! We took a little break from birding to look around the main part of Idyllwild where they have lots of shops and restaurants. On the recommendation of the lady that we ran into in the morning, we went to Cafe Aroma for lunch. If you are birding in the area and want to stop for lunch, you must go here! On the way out of town, Stephanie suggested that we stop by the quail spot again. We saw the first one right as we pulled up and I quickly found 7 more hidden under the bushes. These were my life California Quails! The view on the way back down the mountain. I am now back home in Indiana but I ended my trip with a total of 4 lifers (Yellow-footed Gull, Crissal Thrasher, White-headed Woodpecker, and California Quail). This was not a birding trip but instead a family vacation with some birding sprinkled in so I am extremely happy with my results! If anyone is ever in the Palm Springs area, I would highly recommend a day of birding in the San Jacinto Mountains. What fun for you! Congrats on the new additions to your life list!I would be over the moon if I had the opportunity to visit that area. Thanks! It is a really awesome place to bird and I hope more birders will explore the area! 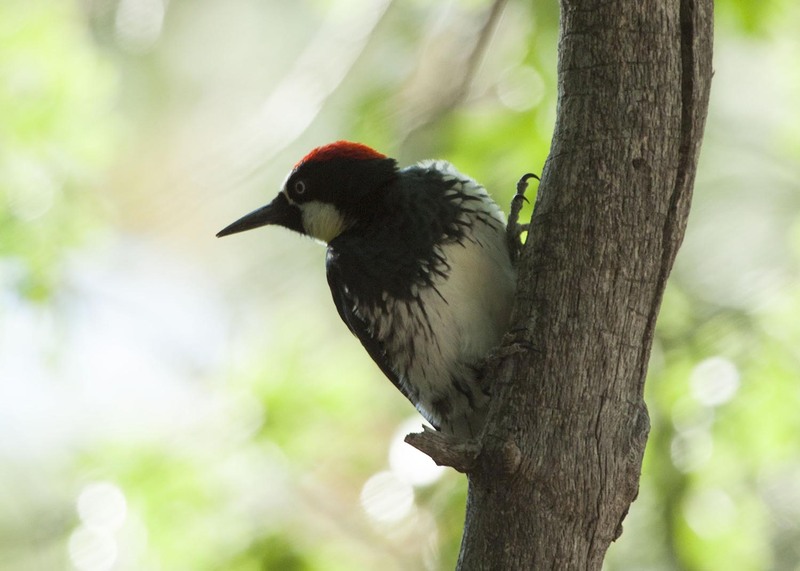 Wow, that White-headed Woodpecker is a beauty! Your trips sounds like it was very productive and wonderful. Thanks Mia! I have been wanting to see the woodpecker for a very long time and was extremely excited to finally see it! Passei para conhecer o seu blog e admirar suas fotografias. São lindas, com riqueza de detalhes. Sounds like you had a lovely outing in the San Jacinto Mountains. All of the birds you mentioned would have been life birds for me. A very special treat seeing the White-headed Woodpecker. Beautiful photographs! Thanks Julie! I hope you have a chance to see some of the birds would have been lifers soon! Well done Rob! Nothing like leaving a family vacation with a few lifers in the ol' back-pocket too! Way to take the opportunities! Thanks Lawrence! I have been getting a lot of practice birding on family vacations and I love it. New places and new birds but still lots of time with the family! I was able to sneak away to the Salton Sea for a morning as well. Thanks Linda! The woodpecker was my favorite but it was very nice to see the quail! Sounds like a great place for birding! Love the Acorn woodie and the cool whitehead woodpecker. Congrats on your lifer. Great post and photos.